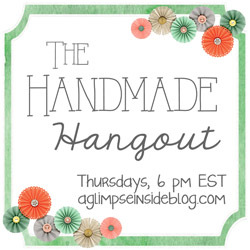 Tomorrow is Friday, the weekend is almost here, but first it is NOW time for the Handmade Hangout Party! Share your ideas below and visit a few that catch your idea. We all love when we get a little love on an idea that we worked hard on.